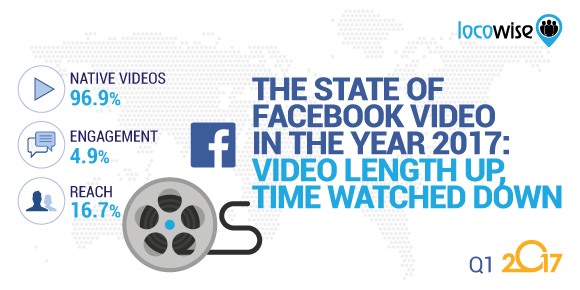 Welcome to our state of Facebook video study for the first quarter of the year 2017. We looked at more than 500 Facebook pages and their video activity in the first three months of the year. These pages have 180 million page likes between them and they have published more than 12,000 videos in the time period we looked at. Let’s see what we can learn from all the numbers. 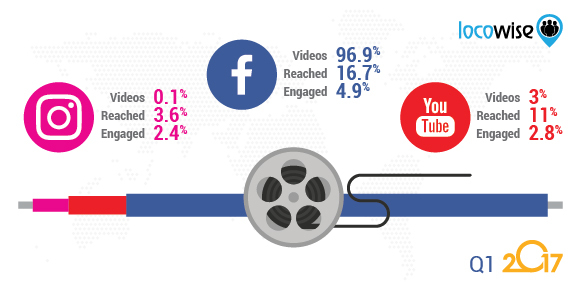 96.9% of all videos published were native Facebook videos, 3% were YouTube videos, and 0.1% were Instagram videos. The native Facebook video reached 16.7% of the total audience on average, while YouTube videos reached 11% and Instagram videos reached 3.6%. Native Facebook videos engaged 4.9% of the people reached, while YouTube engaged 2.8% and Instagram 2.4%. There’s a clear benefit in posting native Facebook videos only (62% more reach than a YouTube video on average per post) and it’s good to see that majority of brands have learned that and have moved away from posting YouTube links which was the norm only a few years back. Last time we looked at these numbers, the number of pages posting in the native Facebook video format was at 79.6%. The average number of videos published by a page in this period was 24, but the twenty of the most active pages published 52% of all videos. 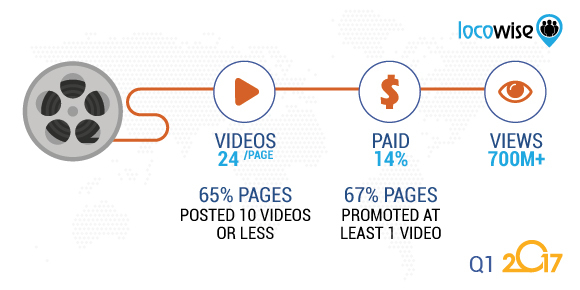 64% of pages we looked at published 10 or fewer videos in the first quarter of the year. The total video views were at nearly 700 million. 14% of all video views were paid for using Facebook advertising and 67% of all pages paid for at least one video view during the quarter. To remind you, Facebook defines a video view as a view of three seconds or more. As Facebook videos come to life and auto-play as users scroll through their news feed, it’s important to look deeper than just the “view” metric which in many cases doesn’t tell you much about the actual stickiness of a video. So let’s dig deeper now. Brands may be on board with Facebook’s messaging about the importance of video, and it’s the right move as the average reach and engagement for videos are higher than other content formats, but users seem to be less convinced. The average length of a video published in the first quarter was 3 minutes and 48 seconds, but the average time watched was only 10 seconds or only 4% of the full video length. Last time we looked at these numbers, the average video length was only 55 seconds while the average time watched was at 18 seconds. The latest figures show that pages now publish much longer videos (a length increase of 315%), while users watch less (a 44% decrease). Remember that mid-roll video ads are only showing on videos longer than 90 seconds and only to those viewers who have watched for at least 20 seconds. Pages that monetize with ads do need to work hard to get these numbers up. 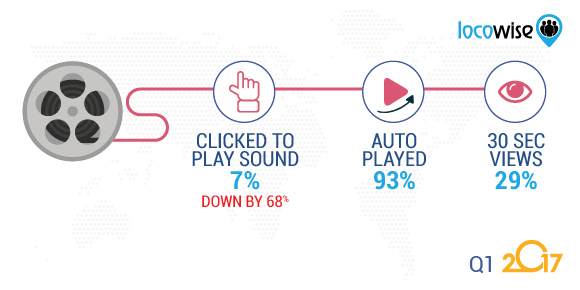 Only 7% of all video views were clicked to play sound. In other words, 93% of all video views we looked at were auto-played as users scrolled through their news feeds and didn’t have any sound on. This is a 68% decrease in clicks to play sound since our last study. 29% of all views were what Facebook calls “30 second views”. 30 seconds views are the number of total views which lasted at least 30 seconds or 97% of the video length, whichever occurred first. 16% of all “30 second views” were clicked to play sound. Despite the video format being the king of content formats on Facebook, it’s difficult to find many positive trends. Brands may be posting more and longer videos, but users are watching less and seem more than happy to watch without sound on as well. Facebook does seem to recognise this and the global roll-out of videos auto-playing with sound on (for users who have sound turned on) will be done by end of this year. 1. Keep your videos short. People don’t stick around for long. 15 seconds (or fewer) is a good time to aim for if you want to capture the full attention of the largest percentage of your audience. 2. If you do have something more substantial to say, consider breaking this into several shorter and easier-to-digest videos. These shorter videos should be worthy of a standalone clip (as most people would be happy to only watch for a few seconds), but should also be used as a preview to your longer content for those deeply immersed users. Add a call-to-action to these short video posts as an option for the immersed users to start exploring even deeper. 3. Most views will be mute for now so make sure your video gets the point across without sound. See our guide on making videos work for the new silent movie era.